Jack Whitlam - THE MASSACRE AT LE PARADIS - HELL IN PARADISE - MAY, 1940. Platoon Serjeant Major Jack Robert Whitlam: Son of William Henry and Florence May Whitlam; husband of Eva Alice Whitlam of Sprowston, Norfolk. Died, aged 36. Jack Whitlam's granddaughter Sally Sowter has kindly sent us the following information and photographs about her grandfather. "Robert Jack Whitlam (known to everyone as Jack) was born in Thorpe Hamlet, Norwich, on 10th April, 1904; the third son in a large family. We do not know much about his childhood, but the early part of his working life was spent in a bakery on Silver Street (Road?) Norwich and above is the earliest photograph we have, showing him standing behind the counter with other staff. It seems he decided quite early on that being a baker was not for him. He wanted something more exciting so, in July 1919, he enlisted in the Army in the Royal Norfolk Regiment. Official records show he had fair hair and hazel eyes but there was obviously some ‘discrepancy’ over his age. It’s recorded as 17 years, 4 months but in fact he was only 15 years old at the time. (This was probably the case for many young men enlisting in those days, and more recently I believe.) The photograph below must have been taken when he first joined - the uniform looks a bit too big for him! He initially signed up for nine years, plus three years in the reserves and he clearly enjoyed all that the Army offered. However, he didn’t have an entirely unblemished military career! He was appointed Lance Corporal in May 1922 but was ‘deprived of L/stripe by C.O. 25/9/22 for drunk entering barracks about 22.30 hours’. Later, on 16th March 1923, he was ‘awarded 14 days detention by C.O. for 1) Refusing to obey an order and 2) Insolence’. In his defence he was still a teenager at the time and thereafter appears to have settled down. We have several pictures of football teams, most including Jack, so it’s clear that this was an important part of his life. The first picture shows him seated behind the ball (so he may have been captain of this winning team). On the reverse of the photograph it says ‘No. 2 Platoon champions’ and the date on the ball is 1926 (we think!). The second picture shows him seated second from the right. Being in the British Army meant travelling the world and Jack certainly did that. He was in Belfast, Aden (possibly – his third class regimental swimming test certificate is printed with Aden 1923), Jamaica (where he successfully passed English, Maths and Map Reading in 1924), Egypt (we have a photograph of him with ‘Boxing Day Egypt 1927’ written on the back), Shanghai (another swimming test in 1929) and India (Amritsar). In August, 1927, he extended his service to complete 12 years ‘with the colours’ and in September 1930, when in India, he was re-engaged ‘for such a term as shall complete 21 years’ service’. His 21 years would have been completed on 8th July 1940. In 1931/32 Jack was back in Norfolk where he met his future wife, Eva Huggins. They were married on 10th December, 1932, and twins (a boy and a girl) were born in September, 1933, while they were living in married quarters in Devonport. A sister was born in May, 1935, in Norwich. In September. 1937, Jack was posted to Gibraltar and the whole family went. This was a happy time for them all. Photographs taken on the beach show everyone smiling, laughing and enjoying the sun and sea. The photograph of Jack and Eva on the beach drinking tea from cups and saucers (of course), evokes a time long gone! When the situation in Europe deteriorated, the family returned to the UK, via Malta, arriving back on 1st February, 1939. When war was declared, Jack was sent to France with his battalion. The family has a few letters he wrote to Eva while in France and we know he had two periods of leave – 29/12/39 – 8/1/40 and 7/4/40 – 18/4/40. His War Office records show he was reported missing on 19th June and then ‘killed in action between 10th May and 22nd June’. That entry was made on 22nd June and his service counted up to that date – officially he had served 20 years and 350 days – just 15 days short of his 21 year engagement. For the next five or six years the family did not know exactly what happened or when Jack had been killed. 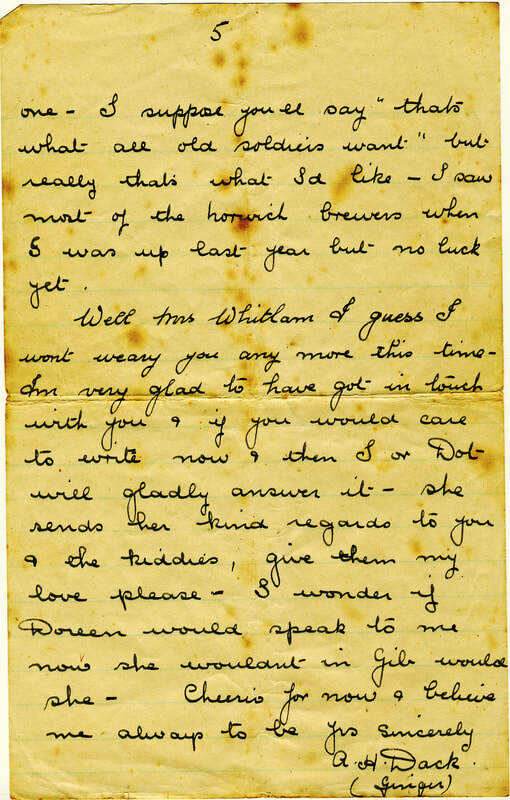 Eva tried to find out more, as this letter dated 24th September, 1940, shows and the letter dated 11th December, 1940, from the War Office indicates that there must have been at least one moment when she thought he might still be alive, having been taken prisoner. So many families must have gone through this dreadful experience. ​It wasn’t until May, 1946, that Eva received more information. Sergeant Dack had been in France too, but with a different Company (‘D’ Company?). He had been taken prisoner and, when he returned to the UK, he wanted to contact Eva but didn’t know her address or her circumstances. He finally decided to put a Roll of Honour notice in the Eastern Daily Press in the hope Eva, or someone she knew, would see it and contact him. This is what was in the Eastern Daily Press (EDP) newspaper on 27th May, 1946. ​We can only assume Sergeant Dack left his address with the EDP and instructions to say they could pass it on should Jack Whitlam’s family contact the newspaper. This is what Eva must have done, writing to ‘Ginger’ Dack straight away. Fortunately we have his reply to her dated 30th May. Clearly she contacted him as soon as she saw the In Memoriam notice. This photograph of Sergeant Dack stood on my grandmother’s sideboard for many years. On the basis of that letter, and assuming the stretcher bearer Sergeant Dack spoke to was correct, Jack Whitlam was killed in action on 27th May, defending the Battalion HQ in the farmhouse at Le Paradis. Now the story moves on 78 years! I am one of Jack Whitlam’s grand daughters and a few weeks ago I started reading through the information on the website put together by Dennis, John, Peter and Nick. I knew the story of the massacre at Le Paradis and that our grandad had been there, or very close by, when he died. However, my mum only had the letter from Sergeant Dack as ‘evidence’ and had always wondered if there were any more details to discover. She particularly wished she could have met a man who was at Le Paradis and who was interviewed by the BBC in 2015. Imagine my surprise when I read, on the website, Bob Brown’s account where he says ‘CSM Whitlam came round with the rum jar and said: “We might as well have this before the Jerries get it.” From Bob’s account I knew this must have happened on 27th May. I then contacted John Head via the website and things happened very, very quickly! Firstly we discovered Bob Brown is still alive, then we found out he is the man mum saw interviewed on the television in 2015 and then, thanks to the efforts of John and Ralston Ryder, we were given the opportunity to meet Bob! All of this was so unexpected, but such a wonderful opportunity. Bob and mum then exchanged memories of Gibraltar and the return to the UK, via Malta. Bob talked through events at Le Paradis and confirmed Jack Whitlam brought the rum round at midday or possibly a little later. He didn’t actually witness what happened to Jack but, as Bob was based in the cellar of the farmhouse, this confirms that Jack was either in the building, or very close to it, when he died. Another piece of information came to light regarding ‘Ginger’ Dack – Bob said that Sergeant Dack was PSM for ‘D’ Company, the Company Bob was in. After the war, Bob joined the Territorial Army and spent some time near Plymouth. On one occasion Sergeant Dack visited and spoke to Bob and the other TA members. The time we spent with Bob that afternoon was very special. My mum was only seven when her father died and as a child thought he had somehow lost his memory and that one day it would return and he would come walking through the door. To spend time with someone who not only knew her father in peace time but also saw him, and was very near to him, on the day he died meant more to her than it’s possible to explain." 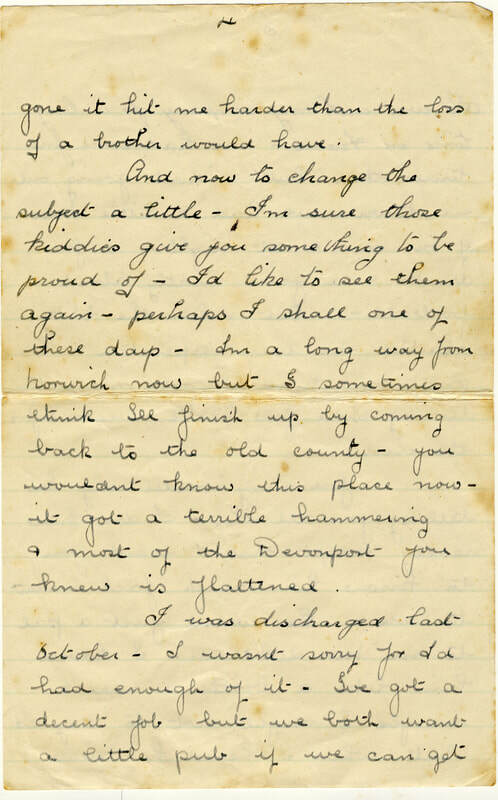 Below are copies of the letter sent by Sergeant Dack to Mrs Whitlam. The letter is dated 30th May, 1946 and the address is 2, Russell Place, Central Park Avenue, Pennycomequick, Plymouth. I was very pleased to get your letter yesterday - when I first thought of putting Jack's memoriam in the paper I wondered if I would be doing right. I knew you would be almost certain to hear of it and I knew it would open up a wound which maybe the passing of the years had at least partly healed - but I did so want to let those to whom he meant anything know that I hadn't forgotten him. Now that I've heard from you I know I did right - and even if it still does pain you to talk of him I must, and there aren't many left except you and my wife to whom I can speak. gone it hit me harder than the loss of a brother would have. And now to change the subject a little - I'm sure those kiddies give you something to be proud of - I'd like to see them again - perhaps I shall one of these days. I'm a long way from Norwich now but I sometimes think I'll finish up by coming back to the old county - you wouldn't know this place now - it got a terrible hammering and most of the Devonport you knew was flattened. I thought about you and those dear kiddies an awful lot during the years I was a prisoner and wished so much I could have written a letter of consolation but I hadn't your address and our letters were so limited that I couldn't enquire for it. one. I suppose you'll say "that's what all old soldiers want" but really that's what I would like - I saw most of the Norwich brewers when I was up last year but no luck yet. He was with my company for a long time in France - we had some fine times then but without going out in town - we had a little mess of our own and at night - a few drinks and a yarn mostly about football - but when the blitz started we were separated and I only saw him at odd moments during those few hectic weeks before the end.